As utilitarian looks and retro-style streetwear gain momentum, some in the fashion industry are declaring the end of activewear and athleisure. Looking back through activewear’s history, from the bodysuit–and–leg warmer days of the 1980s to the baggy basketball shorts of the 1990s and the track suits of the early 2000s, it’s clear that activewear doesn’t leave fashion—it simply evolves over time. Examining the evolution of activewear and its athleisure sibling, it is apparent that this category of apparel has become a mainstay of fashion. Just ask Beyoncé and Adidas, who recently announced they were partnering to relaunch KnowlesCarter’s Ivy Park brand of athleisure apparel. but it is still early in the year and there are uncertainties,” he noted. Levi’s, which was a public company from 1971 to 1985, returned to being a publicly traded entity in late March. Its stock opened at $17 a share when it debuted on the New York Stock Exchange. Recently, it closed at around $22.88.—D.B. The Michael Levine spaces at 917 and 919 Maple Ave.
neck short- and long-sleeve tees. “The latest additions to the American MoCA collection are ideal for an everyday active lifestyle of cycling, yoga, hiking, walking and other activities,” said Sion Shaman, the owner of Expert Brand. Shaman named the collection for both its combination of materials—Modal and cotton—and its California roots, with each piece made in the United States. Expert Brand was started in 1993 by designing, developing and manufacturing performance fabrics. Then two of its largest customers asked if the company could sew T-shirts to respond to last-minute orders from retailers. The company started out with four employees, two apparel styles and less than 100,000 garments manufactured a year. Today, there are more than 100 employees and 200 apparel styles making up the millions of garments made each year. The company’s customer base has grown from a handful of entities to more than 800 companies, including promotional-products distributors, apparel decorators, gyms, yoga studios, sporting-goods retailers and more on the business-to-business side. There’s more on ApparelNews.net. For calendar details and contact information, visit ApparelNews. net/events. Submissions to the calendar should be faxed to the Calendar Editor at (213) 623-5707. Please include the event’s name, date, time, location, admission price and contact information. The deadline for calendar submissions is the Tuesday prior to Friday publication. Inclusion in the calendar is subject to available space and the judgment of the editorial staff. POSTMASTER: Send address changes to: CALIFORNIA APPAREL NEWS, Customer Service, PO Box 4419, Orlando, FL 32802. CALIFORNIA APPAREL NEWS®: (ISSN 0008-0896) Published by TLM PUBLISHING INC. APPAREL NEWS GROUP Publishers of: California Apparel News®, Market Week Magazine®, New Resources®, Waterwear®, New York Apparel News ® , Dallas Apparel News ® , Apparel News South ® , Chicago Apparel News ® , The Apparel News (National), Bridal Apparel News®, Southwest Images®, Stylist® and MAN (Men’s Apparel News®). Properties of TLM PUBLISHING INC., California Market Center, 110 E. Ninth St., Suite A777, Los Angeles, CA 90079, (213) 627-3737. © Copyright 2019 TLM Publishing Inc. All rights reserved. Published weekly except semi-weekly first week of January, second week of July and first week of September. Periodicals Postage Paid at Los Angeles, CA, and additional entry offices. The publishers of the paper do not assume responsibility for statements made by their advertisers in business competition. Opinions expressed in signed editorial columns or articles do not necessarily reflect the opinions of the publishers. Subscription rates: U.S.: 1 year, $89; 2 years, $140. Foreign: $180 U.S. funds (1-year subscription only). Single-copy price $2.99. 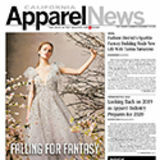 Send subscription requests to: California Apparel News, Customer Service, PO Box 4419, Orlando, FL 32802 or visit www.apparelnews.net. For customer service, call (866) 207-1448.
creora速 Color+ dyeable spandex for excellent color fastness in nylon blends. creora速 eco-soft low heat settable spandex for softer hand and exceptional whiteness. creora速 Fresh odor neutralizing spandex for fresh feeling. www.creora.com creora速 is registered trade mark of the Hyosung Corporation for it s brand of premium spandex. At last! Flame retardant clothing with the comfort of your favorite T-shirt! formalwear to swimwear and streetwear. They also channeled personal trials, family connections and science as inspiration for their collections. The Guess Scholarship recipient, Andrea Isaza, presented clothes that would allow her target audience to experience the power she feels from fashion. The colorful collection featured a faux-fur white coat with red-and-black accents with the message “Pray for fashion” written on the back. Isaza was also chosen as the recipient of a scholarship to Accademia Koefia Roma. Resource Guide PERFORMANCE/ACTIVE/ ATHLEISURE RESOURCES Antex Knitting Mills div. of Matchmaster Dyeing & Finishing Inc.
includes Antex Premier Performance, a line of high-performance, technical fabrics with moisture management, anti-microbial, stain resistant, or UV finishes; and Matchmaster Prints by Antex California, offering design and development of custom prints. Please contact sales@antexknitting.com. www.creora.com Hyosung is a comprehensive fiber manufacturer which produces world-class products, providing innovation and solutions to the textile industry. Only by Hyosung, creora® is the world’s largest spandex brand, suppling the broadest range of stretch fiber offerings supported by exceptional technology and quality. Mipan® nylon and specialty polyester provide functional and sustainable fiber solutions that are essential to today’s dynamic textile market. Hyosung is honored to have five of its fabrics nominated for 2019 ISPO Textrend in the Street Sport, Eco Era, and Base Layer categories. Among them is our thermal regulating scuba fabric, using our aeroheat thermal technology and creora® Power fit high power and heat-resistance spandex, which has been elected Top 10 of the Street Sport category. Great Recession and a mounting challenge from digital commerce. Story relied on whimsy and novelty to attract consumers. According to the company’s website, it sold like a retailer but changed frequently like an art gallery and curated themes like a magazine. Story reinvented the look of its stores and how it changed its merchandise every month to two months. The first theme for Story at Macy’s is Color. The shop will feature clothes from children’s brands Primary and Levi’s Kids. Other brands will include Crayola crayons, MAC Cosmetics’ “Make Your Own” palette stations and candy bars from Compartes. In a recent statement, Shechtman said that Story was to be driven by a new sense of shopping. “The Story at Macy’s experience feels a lot like a real-life version of scrolling through Instagram. You discover things you weren’t looking for but are inspired by all the fun finds—the second you see it, you need it! We aspire to create that feeling with the breadth of the narrative-driven merchandise edit we are bringing to life with the launch of Story at Macy’s across the country.”—A.A. the knowledge, ability, and resources to plant more efficiently and effectively than we would on our own. At our website, www.dohp.com, one can find where we’ve planted, how many we’ve planted, and a link to our non-profit partners. We believe that one day when we’re all gone, it will be our children who will take over and care for the soil—thus our name, Decorate Our Home Planet. This listing is provided as a free service to our advertisers. We regret that we cannot be responsible for any errors or omissions within the Resource Guide. S EW ING OP ER ATOR aren ane a womens apparel manu acturer has im‐ mediate openings for a single needle Sewing Operator. andidate must be able to operate single needle ma‐ chine. Must have minimum 2 yrs experience. B ilingual English/Spanish. Able to work overtime when required. F ax resume to (3 2 3 ) 2 7 7 - 6 8 3 0 , email to resumes@karenkane.com or apply in person at 2 2 7 5 E. 3 7 th St. L.A. CA 9 0 0 5 8 .